“I have to go,” said Kyle. The problem is that Kyle is a three-toed sloth living high in the rainforest canopy. And he’s a slowpoke. And the “bathroom” is wa-a-a-ay down on the forest floor. And on this day, of all days, mama sloth decides that Kyle is old enough to go on his own. 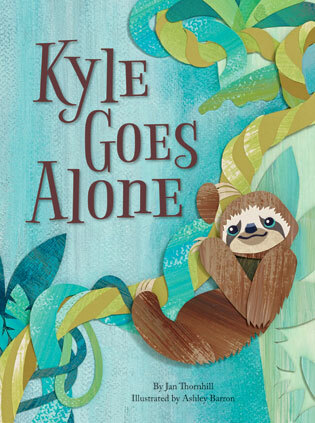 What I like about this book: As Kyle descends down, down, down the tree, he is never alone. Not only does mom follow him (though she stays mostly hidden), he meets other inhabitants of the rainforest: a red-spectacled parrot, a whipsnake, a tree frog. I also like the repetition of Kyle saying, “But I’m all alone!” followed by “No you’re not” croaked or screeched or hissed by an animal living somewhere on or near Kyle’s tree. I like that the illustrator uses the book, making us turn the book sideways for more vertical illustrations that help depict just how far down Kyle has to climb. And I like that Kyle makes it all the way down by himself… and “goes”. Plus there’s back matter, which I love because it fills in the gaps of the story. And I love the cut-paper illustrations. This is a completely different take on your “Going to the Potty” book. Head over to Archimedes Notebook for some beyond-the-book activities. Copyright © 2015 Sue Heavenrich All Rights Reserved. I write about science and environmental issues for children and their families.